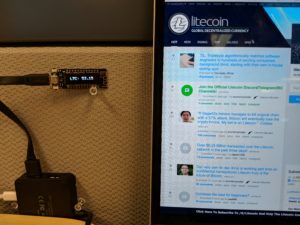 This is going to be a short one for my friends on /r/litecoin who asked for a tutorial after this post. So here it is. There are many variants of the esp8266 micro controller with an oled, all of which will work for this application (possibly without any code tweaks) but I chose this one from ali express due to its compact size, and the fact that it was only $6. Because this tutorial is aimed more at the good people of /r/litecoin I will try to be verbose because there is a good possibility this will be there first venture into embedded development. For the rest of you, skim over most of this but pay attention to the platformio customization and proceed directly to the code. Install platformio <- this guide is better then anything I could write, so please just follow that. copy the innards from wifikit8/platformio into the PLATFORMIO_HOME_DIR merging all the folders. Due to being short on time, this code is pretty rough, yet functional, as a side effect of this being rough code I have not had time to bring in WifiManager to set up the wireless network as I usually would. I will leave this as an exercise to the reader, and I am accepting pull requests! If it uploads successfully you should be done! If there is any interest in purchasing one of these pre flashed and ready to go please let me know! It might take a bit because I’ll need to order more boards but I’ll 3d print a simple case for it to make it alittle more robust! If you know how I can submit this board variation to platformIO please let me know, I have not been able find any info.